" Quietly cold – the title of this album may be somewhat misleading, as the music is neither as quiet nor as cold as it suggests. Intense songs, a girlish-fresh, innocent-sounding voice, the concise flute-playing of the bandleader and a compelling, swinging groove: these are the outstanding features of this evocative, drum-less quartet." Fascinated by the Piccolos of the Basel carnival, Ben Zahler picked up the flute at the age of eight. Yet, before he could switch to the Piccolo, he dived down into the world of Jazz clubs and never looked back. After attaining his “Master of Arts” at the Swiss Jazz School Bern with Andy Scherrer, Bert Joris and Günter Wehinger, he toured with his Band aloft (among others with Nadja Stoller and Stefan Rusconi) and recorded his first album “We do” (TCB 26802). Other notable records include the “Paul Klee” record by the Swiss Jazz Orchestra directed by Jim McNeely. 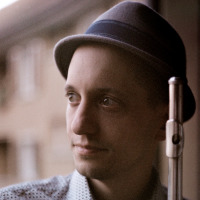 In the past years, Ben Zahler has been an active member of the Basel Jazz Scene, performing with various bands and also supporting the scene by organizing jam sessions and concerts. In this time, he has performed with rising stars in the Swiss jazz scene such as Yumi Ito, but also with established artists like Hans Feigenwinter. In 2015 he founded his new band “Ben Zahler’s Songgoing”, which has toured since Switzerland and Germany. The band plays with very few exceptions original compositions by Ben and the other band members. In November 2018, the band will publish its first album “Quietly Cold”(TCB 35902). All About Jazz musician pages are maintained by musicians, publicists and trusted members like you. Interested? Tell us why you would like to improve the Ben Zahler musician page.